Multicultural Arts and Media Centre organising Free community Arts for Health & Wellbeing Event on Saturday 18th April 2015 at MAMC from 11am to 4pm. Supported by: Link4Life, HMR Clinical Commissioning Group SIF, NHS Greater Manchester, Lancashire and South Cumbria Strategic Clinical Network. Are you 16-18 years old? Looking to work in the Arts? Helping people in our communities? 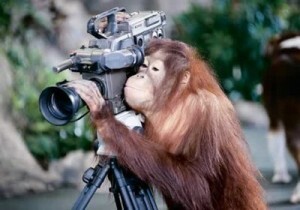 Then this is your opportunity to be part of a team of professionals and a fabulous company at Cartwheel Arts. At our last workshop, our facilitator, Norman Warwick, gave us the title of “A piece of writing which changed the way I write”. Mmm, interesting, I thought, though I have yet to be inspired by this. I hope you might do better! 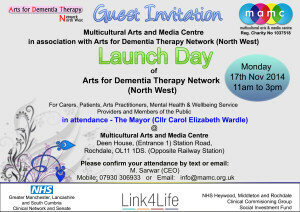 Multicultural Arts and Media Centre (MAMC), in collaboration with Arts for Dementia Therapy Network (North West) Steering Group proposes to support carers and people living with Dementia by using creative activities as medium to improve the health and wellbeing. MAMC has facilitated the Networking Steering Group over the last 5 months, involving 18 members at 6 meetings to consult and identify the needs for people living with Dementia. We have collectively discussed and identified the need for the Network and projects through their knowledge of working in the borough. 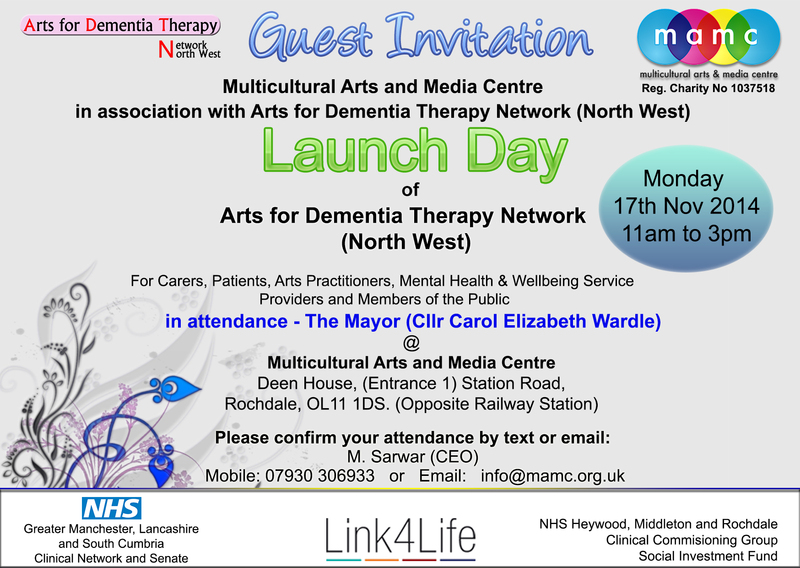 The Free Launch of the Network Event is being held on 17th November 2014 at 11am to 3pm at MAMC, which will be attended by The Madam Mayor, Cllr. Carol Wardle, Ian Mello (Director-HMR CCG), Kim Wrigley (NHS-Quality Improvement programme Lead), Maqsood Ahmed (NHS-Strategic Clinical Network Manager), Cllr. 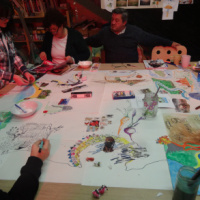 Cecile Biant (Health & Wellbeing), Herbert McKenzie (BME Health & Wellbeing Board) and Artist workshops to further engage, involve users and increase membership from the wider community to listen to their views to implement within the proposed projects and the development of the Network. Service providers will also be present to provide information and support available to client groups.